A not so recent addition to the Kel-tec line-up is the Kel-tec PF9. It’s been around for a while and has proven to be reliable. It is an excellent small 9 mm semi-auto that makes for a good concealed carry pistol. Magazine capacity is 7 rounds with one in the chamber. It is overall thinner than most 9 mm this size at .88 inches thick. Though it is small, please note that the pistol in my back pocket holster will most likely not fit in regular jeans pockets. It is a little too tall. You may find that pants such as cargo and carpenter style pants with larger pockets may conceal much better. 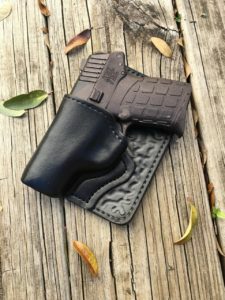 Holster size: 5-7/8 inches tall by 4-1/2 inches wide. Right-handed holsters only. For more details about this pistol go here. Review of this pistol on Youtube. 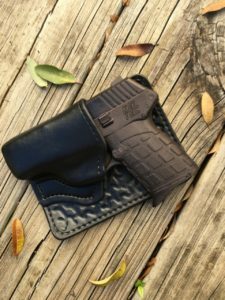 This holster is for the KEL-TEC PF9 no laser attached. I currently do not have a holster for this pistol with a laser. Maybe later.